Don’t put cold liquid in a hot crystal glass. Or wash a cold crystal glass in very hot water. It might shatter. Blindfolded, I can tell the sound of clinking crystal glasses (rather than glass) at a classic toast of champagne glasses… The sound is clear, sharp, and frankly, “expensive” when compared with glass. 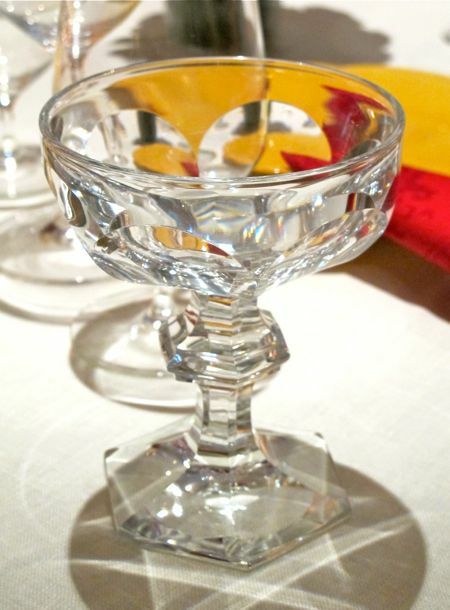 Lead crystal (the percentage of lead in glass that makes it “crystal differs from place to place) leads to a heavy, but beautifully clear glass (hence the phrase “crystal clear”) that absorbs and reflects light (particularly candlelight) beautifully. Probably unhealthy for you if used three times a day, lead crystal is fine for that every once in a while special occasion. It seems counter-intuitive that something like glass with a high “lead” content might be more fragile than regular glass, but it is. Crystal has a horrible penchant for chipping and shattering when hit against other materials (including other crystal glasses) so you need to be extra careful when storing, using, cleaning and moving your crystal. Does lead also contribute to the thickness of the glass as well? Or is it just the manufacturer’s heat treatment that determines if their crystal glasses should be thin of thick? Thanks! There is nothing more decadent using fine crystal ..they are pain to hand wash and dry,now some newer fine crystal available in dishwasher safe e.g. Waterford. I love crystal stemware especially on a candlelit dinner..nothing more spectacular when the lights are dancing on crystal.Thanks for the tip.I gotta to find #1. Do you know that if you have a very small chip in a crystal glass, can smooth it out with super fine sandpaper. I actually use a fine emory board. I’ve done that with a couple of my glasses. Clinking crystal for a toast makes me cringe. Please go easy, specially with faceted or cut crystal. Put out the cheap glasses for toasting. Blown, cut or engraved crystal celebrates an almost extinct craft. Best purchased at auction or antique stores for much less than original price. Even Steuben went out of business last Christmas given the current generation’s penchant for machine dishwashing everything. Waterford is bankrupt and it’s recent output produced cheaply elsewhere. So for quality trawl those flea markets and antique shops. Flea markets in France are awash in Baccarat, and Daum. America, particularly NY, produced the highest lead crystal in the late 1800’s and early 1900’s before WWI put the lead to other uses. To wash crystal place a dishrag or plastic mat on the bottom of your sink. Wash only in lukewarm water, room temp, with a clean sponge and very little liquid dish soap. Rinse thoroughly. Dry upright, the lip is the most fragile part of the glass. Use a clean cotton or linen towel to towel dry. Paper towels sometimes leave lint. The lead content contributes to the clarity of the glass. Don’t store your wine in an old decanter, but drinking out of lead glasses occasionally is not worth worrying about. I might have my crystal, silver, and china buried with me unless my kids start to show an interest. Other option is to send them to Marketman’s home in those BB boxes where it will be appreciated. And thou shalt not deploy crystal with glass in any party. The glass vessels will invariably damage the crystal ones. My snob’s Greshams law of entertaining, the cheap chasing the valuable stuff out of circulation. @Sister’s “I might have my crystal, silver, and china buried with me unless my kids start to show an interest,” dangerously reflects my own sentiment. Thanks for this practical tip, MM! The Swedes are lucky to have an access to a number of practical and less practical crystal glasses and silver through the auction houses. Depending on one’s need and desire, one could bid for a set of old crystal glasses, hardly any fluted champagne glasses though, and sets of silver flatware in various shapes and makes. Some of the bid prices are ridiculously low, it’s better than buying at IKEA! On another topic. Sister, I was going throught he archives and saw your cinnammon rolls recipe. That’s my son’s favorite. He is coming home for the weekend from college. I am making it. He can have baon to bring back to the dorm. I am excited my baby is coming. Thank you so much for the recipe. God bless you and MM for your generosity and kindness. I do use my china, silver, and crystal. My kids just don’t want to hand wash. I gave them complete sets when they got married and they are still in my pantry because they don’t have any cabinets for them. Next time you are in Paris go to the Vanves flea market early Sat morning, lots of Baccarat for 3-5 euro apiece, even flutes, and often sets of 12. It costs more to have an extra piece of luggage to take them home. We also have plenty of NYC auction house finds. Get some fresh yeast and good luck with your cinnamon roles. enjoy the weekend with your son! I wish I had this problem! After some years wandering the world we finally got our cargo in the (hope to end my life here) home in Paris. Lots of stuff I could really live without but glad the family photos arrived including some distant nearly unidentifiable Lilangs – BUT they lost the box with the Kitchen Gear! My Le Creuset casseroles! The baking dishes! The seasoned cast iron grill pans! I can live without the crystal….but I miss my pots, pans, my ceramic knife sharpener…….all these meals of my life! Oh.. sister you are so right!! like you..i love finer things in life.. we moved quite often and collected fine crystals,silver ,& china .My daughter own her home ,still wont take hers, my son is single.. i am awaiting for them to mature to appreciate them..i chuckle on “they maybe buried with me” i feel the same way ! !yet..still my hubby still buys me “stuff” on his travels and on line. Thank you for the tip..
Hi MM – agree with Ariel above. One may say a rose by any name is a rose but….we use our better wine glasses for both expensive and inexpensive wines and the latter taste better. Yes, handwashing crystal and fine cutlery is always a pain in the … esp if you have a huge dinner party not to mention the everyday dinners, not unless you’ve got help. There should be a dishwasher just for these things :)) Your handwashing instructions for crystal are so clear and exact, you must have done this tedious task a number of times, if only to make it right and keep the precious crystal. While living in Manila, I remember instructing our help on the fine art of handwashing crystal glasses and vases, but we still ended up with some chipped glass, alas! Many thanks for the Vanves flea market tip, I’ll put this in my Paris to-do-list for the Easter trip. I hope to find a small collectible or two or a partner milk jug to my NY bought sugar bowl. Cheers! It feels like a long wearing away of oneself with the gradual loss of things that provided so much enjoyment over many years. First Gourmet magazine, then the shocking final sale sign at the Steuben showroom. I commented once hereabouts what a quiet and snug respite this magical display of crystal artworks this shop held in store for those fleeing the cold and the noisy crowd of holiday window watchers along Fifth Avenue was. At least with Scribner, the Beaux Arts storefront remains. My last tip for washing crystal is to set it aside for next morning when you are rested rather than doing it in the middle of the night. You might want to give red wine glasses a quick rinse before setting aside. There is some pleasure in handling fine crystal, china and silver so I don’t mind doing it myself, even if I have help for the dinner. If it breaks I have no one to blame but myself. A lot of antique china and crystal are in perfect shape because they were never used and spent decades in a cabinet. I like to use whatever I have since they have been purchased primarily for my personal enjoyment. I don’t tell my guests they are drinking out of Steuben or Baccarat, eating with antique silver or scraping the birds off the Herend. I just grit my teeth and hope for the best. Footloose, I did visit the Steuben showroom on Christmas Eve for old times sake and now I’m sorry I didn’t bite the bullet and buy a beautiful cheese bell, one of a kind, that they had displayed by the front door. They were giving away Steuben books as mementos. Over the years I’ve collected their tear drop wineglasses which occasionally show up at auction. The ones I have are from the estate of Sen. and Mrs. Jacob Javits, long time fixtures on the NY political and social scene in the middle of the last century. Impressive provenance, sister, the very fellow after whom the convention center was named. As for the rest of your stuff, I guess, Pigman’s sister would carry that certain distinguishing feature to this blog’s fans. On the opposite end of the scale though, it’s amazing what fascinating aura proper provenance can lend to objects in buoying up their value as witness the mad auction bids for the otherwise worthless tchotchkes collected by Andy Warhol. Jeremiah Tower ended up in Manila? What’s the story behind that? I find stories of Chez Panisse chefs quite interesting. @PITS, MANILA, i think the aroma of the banana leaves contributes to the taste of food and make it taste better. We live in very unsettled times. Waterford Glass were unable to pay Irish workers the going industrial rate in Ireland and shifted production to Eastern Europe with disastrous results. A young fella from my Church with a newly minted MBA from Harvard advised me to buy the stock about ten years ago. I was absolutely astonished to hear such advice. In my opinion, dozens of these venerable old names are going to go out of business within the next few years. One must buy tabletop for one’s personal enjoyment and not as an investment. Ebay sets the price and several auction houses specializing in items under a thousand in value have gone out of business. The next generation doesn’t really care what they drink out of or eat with. I can’t imagine an HBS grad suggesting buying Waterdord. He must be unemployed these days.